The Berlin Victory Parade of 1945 was a seminal day in the world of Western tank designers, for the Soviets used it to parade the new IS-3 heavy tank which scared all observers. Ignoring the fact that the tank was a dog which took 15 years to turn into a functional combat system with any sort of viability on the battlefield, both the US and British designers looked to create a counterbalance to this monster. The US developed the M103 series which debuted in the early 1950s, but the British took a bit longer. Their goal was the FV200 “Universal Tank” series whose design development started in 1946. But it was not until 1952 they had a running chassis, which was soon partnered with a Centurion turret to provide the FV221 Caernarvon tank for running tests of the new chassis. 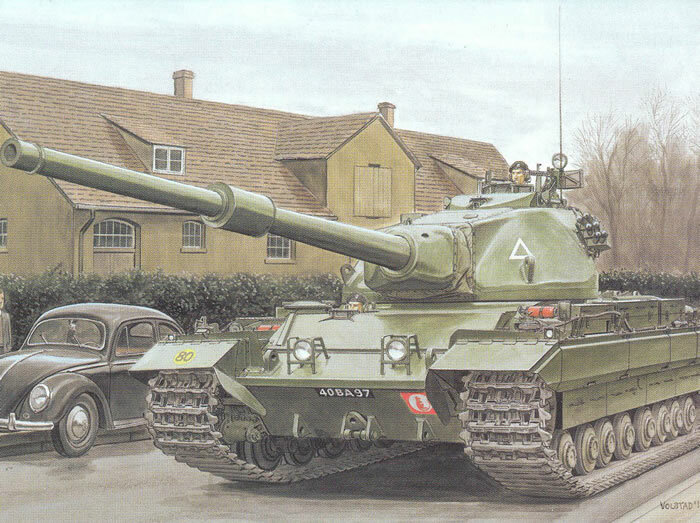 This was later developed into the FV214 Conqueror Mark 1, followed by the Mark 2, and production lasted into 1959. The tanks remained in service through 1966 before being withdrawn. Like the M103, the Conqueror looked to defeat the IS-3 with brute force via a 120mm rifled gun and high-powered AP projectiles. But like the M103 it was underpowered for its size with a very thirsty gasoline engine giving it a road range of only 95 miles. Also unlike the M103 it only had a crew of four - driver, gunner, loader and commander - so its rate of fire was far less than the M103 which used separate projectile and charge loaders. The Conqueror has only been served in small scale by a 50 year old ROCO model in 1/87 and a few odd wargame ones, as well as some resin kits. This is the first release of a Conqueror in 1/35 scale in styrene, and overall appears to match well with the references I have. The only noticeable bit I see missing is the forward antenna base which mounts at the front left corner of the gun access plate on the turret roof. Most of the dimensions appear to match the ones I have with the exception of the gun barrel which appears to be about 16mm short - oddly enough, the same figure as for the M103 whose gun the Conqueror’s 120mm was supposedly based on. The shortage appears to be on the section between the bore evacuator and the mantlet for anyone wishing to try and correct it. While the box art claims it is a one-piece barrel it is not - it is two piece with a joint in the middle. Note that all one needs to get a smooth joint is a Flex-i-File tool and about three minutes. I believe they did this was to avoid warpage and sink marks which are common on large solid parts. But here once again DML’s marketing and engineering departments appear to not be communicating! The rest of the kit is nicely done. There is no detail on the inside of the hatches, but in this case they “pop and rotate” so nothing is visible anyway! The suspension is nicely done and replicates the massive assemblies used on the original. Each bogie assembly (there are eight) consists of nine parts, but they are mostly hidden under the skirts when installed. As the original tank was very “bitty” with a lot of bits added on after the main components were assembled, the kit does a nice job of replicating those features. Some features are beautifully done such as the “slide molded” stowage bins with full details on the outside and top sections. There are two tow cables but the kit directions are not very good at showing that other than the numbers in parentheses to show two sides for their installation - the right one is hard to see in the directions. The overall layout of the turret is nicely done, and the bustle basket matches the photos and drawings I have. Unlike their Saladin kit it also has a nice .30 caliber commander’s machine gun on the commander’s cupola. Note that photos show the tanks with three antennas, but only the rear two antenna bases are provided. The kit’s antennas are too heavy and most modelers will want to replace the “whip” portions with either wire or stretched sprue. The tracks are twin sections of DS plastic with a total of six links (three per section end) overlapping for attachment. Given the loose fit of most tracks, this should allow the modeler to cut and adjust them for a proper taut fit. While they seem a tad thin in depth the width is correct. One really smart move is that DML has made the canvas weather shroud between the gun mantlet and the turret front from DS Plastic, so it is flexible and still fits the gap. This is a smart use of the DS material and much easier to deal with than either vinyl or injection molded styrene. Peter Brown, editor emeritus of the “Track-Link”, and Ken Jones, editor emeritus of “Military Modelling” are listed as consultants. Finishing directions are for two vehicles, both in British Bronze Green: 7th Armored Brigade, BAOR, 1960s (registration number 05 BB 96) or BAOR 1967 (registration number 41 BA 19). A small sheet of Cartograf decals is included. Overall, other than the disappointing short barrel this is a nice kit and should be an easy build. But I have seen some truly embarrassing “reviews” of this kit - at least one of which was done without the kit in hand and another which declared that a competitor’s forthcoming kit “must” be superior to it. Such people would do well to get the kit in hand first and view it objectively, not dial in their personal biases.